The Rams served up the College of Redwoods winning in four sets at home on Sept.21, with a strong defensive performance and an impressive performance from Allysha Seuteni who was coming back from battling an injury. 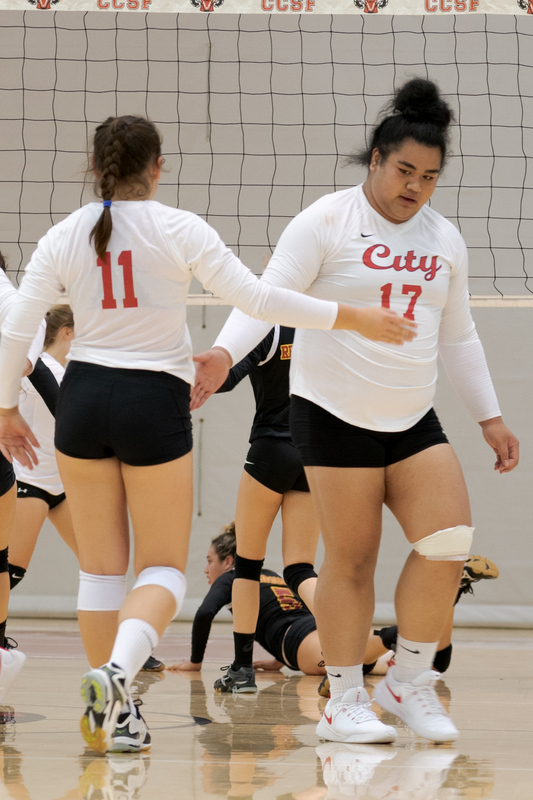 City College’s serving game was on point from the beginning. Helping them win the first set 25-22, which ended with a phenomenal block shot from Allysha for the winning point. The Rams struggled in the second set playing from behind most of the game. At one point down 12-17, they turned things around by going on a 8-0 run to take the lead 20-17. Despite the run they ended up losing the set 24-26. After losing the second set, they never looked back and dominated the third and fourth set winning both sets 25-19, and 25-22 respectively. It was a great team performance with different players contributing to the win. Allysha Seuteni led the team with 16 kills, while Tiara Poquis contributed with 34 assist. Takori Coleman led them with 21 digs. Head Coach Saga Vae was very impressed with the way that the team played together, being that this was the first time that the team was at full strength. “ We have been state contenders the past couple of years, we lost 3 sophomores, and lost All-Americans. We have a new group, and the non-starters were able to step up and a play an important role in our win.” Coach Vae said. Despite the slow start to the season Coach Vae is excited about this group going forward and connecting with each other to compete for a State title like the program is known to do.